During his NBC years - including his first two seasons on Blue - Benny never finished out of the Annual Top Ten. He was always among Sunday’s Top Five and his show was first on Sunday night four times. After he moved to CBS in 1949, he produced Sunday’s top ratings for four of the next five seasons. The closest competition for his eight seasons of Sunday night leadership came from Edgar Bergen’s six first place finishes. Jack Benny dominated his 7:00 Sunday time period for 19 consecutive seasons of Network Radio’s Golden Age - a record approached only by Monday’s CBS blockbuster, Lux Radio Theater, which ruled its 9:00 timeslot for 18 straight seasons. How did the self-deprecating comedian whom everybody “loved to hate” do it? 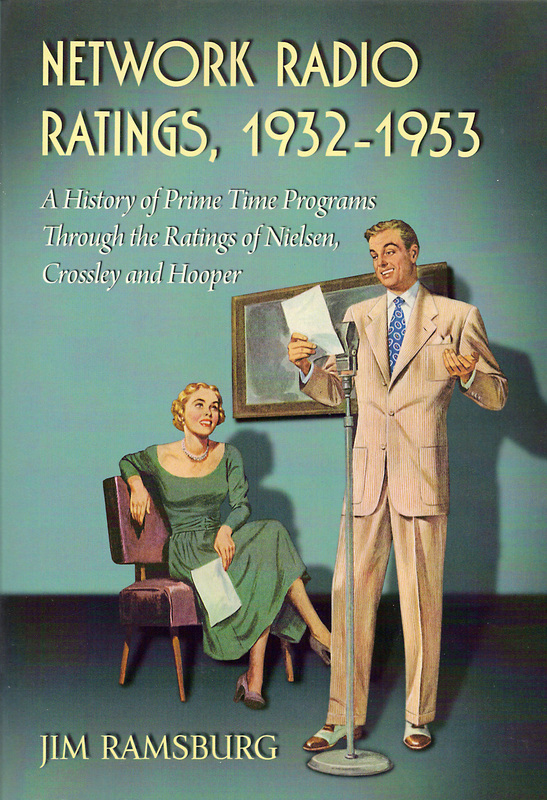 Network Radio Ratings, 1932-1953, identifies Content, Competition and Consistency as the keys to audience popularity. Jack Benny was the personification of this formula. He and his familiar cast consistently delivered reliably funny and often predictable content every Sunday at 7:00 p.m. ET from October 14, 1934, until May 22, 1955. Recorded repeats of Benny broadcasts were heard for two encore seasons, and again on Sunday at 7:00. Seven o’clock on Sunday wasn’t considered prime time radio real estate until Benny arrived in 1934. The 30 minutes were filled with a hodge-podge of forgettable music and public affairs programs of different lengths in 1932-33. Variety came to the time period in 1933-34 with The Court of Human Relations on NBC, (8.1 rating), Ethel Waters’ American Musical Revue, (5.2 rating), followed at mid-season by The Marx of Time with Groucho & Chico Marx, (9.2 rating), on CBS, and Jessica Dragonette’s unrated half hour concerts on Blue. But opposed to these single digit offerings at 7:00, Joe Penner had a 24.9 rating at 7:30 on Blue with his Bakers’ Broadcast for Standard Brands’ Fleischmann’s Yeast. That inspired General Foods to sign Jack Benny to precede Penner on Blue at 7:00. The result of the Benny & Penner tandem was two Top Ten shows in 1934-35 - Benny in fifth place for the season and Penner in sixth. More importantly, Jack Benny had planted his flag on Sunday at 7:00. Benny’s consistency in his time period was matched by the inconsistency of his competition. It ranged from formidable to non-existent. Regardless, the outcome was the same - the perpetual 39 year old from Waukegan always came out on top. The year by year record of Jack Benny’s Sunday evening program appears below including the comedian’s Annual Rating average, his ranking among all prime time programs and the competition scheduled against him at 7:00. 1935-36 Jack Benny (Blue) 25.8 # 2 Tenor Kenny Baker replaced Bartlett in November as Benny’s handsome singing stooge. In competition, Woollcott opened the season on CBS against Benny but left in December, 1935, with a meager 5.1 rating. Meanwhile, Eddie Cantor, who had Network Radio’s top rated show in 1934-35, was having problems on CBS at 8:00 against NBC’s first season sensation, Major Bowes Original Amateur Hour. Cantor took over Woollcott’s half-hour at 7:00 and managed a 15.9 rating against Benny’s 24.9 in their six month, head-to-head battle. Eddie Cantor would be Jack Benny’s last competition to score double-digit ratings for the next dozen years. 1936-37 Jack Benny (NBC) 28.9 # 1 Benny moved to NBC and added Phil Harris to the cast as his wise cracking, hard drinking and skirt chasing bandleader. Eddie Anderson was introduced as a gravel-voiced Pullman porter in March and became a permanent cast member as Benny‘s valet, Rochester Van Jones, in June. Benny registered his first Number One season against the unrated Helen Traubel concerts on Blue and a number of sustaining, fill-in programs on CBS. 1937-38 Jack Benny (NBC) 29.5 # 2 CBS challenged Benny at 7:00 with movie star/soprano Jeanette McDonald hosting the Vick’s Open House variety show. Although praised by critics, Open House could only generate a 7.1 rating, worthy of 64th place in the annual rankings. Blue, meanwhile, filled with a mix of sustaining classical music and public affairs programs. 1938-39 Jack Benny (NBC) 27.7 # 2 Nobody wanted to fight the Benny steamroller. No sponsor wanted to bankroll the attempt and no network wanted to risk it. As a result, both Blue and CBS opened their Sunday evenings with unsponsored, unrated and easily forgotten public affairs programming including The People’s Platform on CBS. 1939-40 Jack Benny (NBC) 30.9 # 1 Dennis Day replaced Kenny Baker as Benny’s singing stooge in October. It was another Number One season without rated competition for Benny, who hit a rating above 30 for the second time in six seasons. Dinah Shore starred in a sustaining 15 minutes of songs on Blue followed 15 minutes of news from war fronts. Meanwhile, CBS presented The World This Week, a half hour news roundup. By spring both networks programmed 30 minutes of unrated war news opposite Benny. 1940-41 Jack Benny (NBC) 30.8 # 1 Benny’s third and final season with ratings above 30 began without rated competition, as Blue and CBS both aired news and public affairs programming at 7:00. Blue continued the practice through the season. But in February, CBS and Wrigley Gum, which presented Gene Autry’s Melody Ranch at 6:30, developed a show in reaction to the Selective Service Act that made over 16 million American men eligible for the draft. Melody Ranch was cut to 25 minutes and segued into Dear Mom, a new 20 minute serial at 6:55, thus getting a five minute jump on Benny’s first 15 minutes. Dear Mom was the tale of two recently drafted men, Homer Stubbs & Red, told in humorous letters from camp. The 45 minute combination of Melody Ranch and Dear Mom - and the promotion behind it - made an immediate spike in the ratings to a first-month 14.7, (compared to Benny’s 37.2), but trailed off quickly into single digits. Meanwhile, Benny celebrated another season as Network Radio’s top attraction. 1941-42 Jack Benny (NBC) 27.2 # 5 Benny’s slide from first to fifth place in the season’s rankings was strictly due to NBC’s Tuesday lineup of Bob Hope, Fibber McGee & Molly and Red Skelton that caught ratings fire, plus Sunday’s popular Edgar Bergen who beat Benny by only 0.8 of a point in the season averages. Benny’s competition at 7:00 on Sunday remained almost nil as Blue continued with its non-rated News From Europe while CBS and Wrigley finally gave up on the failing Dear Mom in December, giving the entire 45 minute block to Gene Autry’s Melody Ranch which finished the season in 94th place. 1942-43 Jack Benny (NBC) 26.3 # 5 Due to wartime sugar shortages General Foods switched Benny’s sponsorship from its Jello to Grape Nuts cereal. Meanwhile, the same five NBC comedy shows remained atop the season’s rankings with Benny again in fifth place. Once again neither Blue nor CBS presented him with any real competition. Blue offered Drew Pearson’s weekly news commentary that generated a 6.3 rating and CBS filled half the season with The Commandos, an unrated action adventure series. 1943-44 Jack Benny (NBC) 23.7 # 5 The first of three major changes in the 1940’s that affected the Jack Benny Program took place in 1943 when the comedian hired a new writing team: Sam Perrin, George Balzer, Milt Josefsberg and John Tackaberry. The group remained with him for the rest of his Network Radio career. Benny again finished fifth for the season behind Bob Hope, Fibber McGee & Molly, Edgar Bergen and Red Skelton as the new writers worked the show into a more standardized sitcom format. But they faced very little competition in the 7:00 timeslot. Blue continued to schedule Drew Pearson with his 7.3 rating and CBS programmed William L. Shirer’s commentary at a 4.3 rating during Benny’s first 15 minutes. CBS filled the final 15 minutes during the fall with the unrated Songs By Sinatra and a quarter hour of pop music featuring Perry Como beginning in January. 1944-45 Jack Benny (NBC) 20.4 # 10 The second major change of the decade affecting Benny’s program took place before the 1944-45 season began when he left General Foods’ longtime sponsorship for a more lucrative contract from American Tobacco’s Lucky Strike Cigarettes. (See Lucky Gets Benny on this site.) General Foods didn’t take the loss of their comedy star graciously. Instead, the food conglomerate bought the time period opposite Benny on CBS and brought in its star from Friday’s Number One show, Kate Smith, to do battle with Benny. It was no contest. Although Benny lost 3.3 rating points and fell to tenth place for the season, the beloved singer lost nearly half of her Friday ratings, falling into single digits and 71 positions in the annual rankings to 93rd place.. Adding insult to injury, Drew Pearson’s news commentary on Blue outrated Smith’s 8.4 rating with a 9.8. 1945-46 Jack Benny (NBC) 21.3 # 7 Mel Blanc joined the Benny cast in a variety of occasional roles. (See Mel Blanc on this site.) Meanwhile, General Foods continued in its pursuit of the comedian who had defected to American Tobacco. In 1945 General took another of its successful Friday night programs on CBS, The Adventures of The Thin Man, and placed it against the comedian. This time Benny’s ratings increased a fraction and he moved up to seventh place while the detective comedy series lost 30% of its previous season’s ratings and dropped from 41st to 78th in the rankings. Meanwhile, Blue sat back with its low cost news programs from Drew Pearson with an 8.3 rating and Don Gardiner’s Monday Morning Headlines at 5.5. 1946-47 Jack Benny (NBC) 25.8 # 3 Benny’s stock continued to rise when General Foods retired from the seven o’clock race and Wrigley Gum took over the time period on CBS for Gene Autry’s Melody Ranch, off the air for three seasons due to the cowboy star‘s duty in World War II. Autry had to rebuild his audience and only managed a 5.7 rating for the season. Blue’s Drew Pearson placed second against Benny at 7:00 with an 8.1, followed at 7:15 by Don Gardiner’s 5.1 rating at 7:15. Mutual trailed the pack with the unrated Mysterious Traveler. 1948-49 Jack Benny (NBC-CBS) 22.9 # 3 The third major change - and the biggest - to Jack Benny’s Sunday program was his mid-season switch from NBC to CBS on January 2, 1949. (2) The CBS coup is detailed in the 1948-49 chapter of Network Radio Ratings, 1932-1953 in a section titled When You Diss Upon A Star. A unique closed circuit program for CBS affiliates featuring Benny, Freeman Gosden &, Charles Correll as Amos & Andy, CBS Chairman Bill Paley and network President Frank Stanton from December 23, 1948, can be heard on the tab below. Benny’s first three months of the season on NBC averaged a 22.7 rating against Gene Autry’s 13.5 on CBS, and the 10.1 generated by Mutual’s Adventures of Sherlock Holmes. Go For The House, a big money quiz on ABC hosted by John Reed King in which contestants vied for a fully furnished new house, was unrated. Benny's final show on NBC from December 26,1948, is also posted below. CBS spent over $100,000 to promote the comedian’s switch to his new network home, including a huge layout in Life magazine and ads in over 600 newspapers. NBC countered with its own $100,000 campaign advertising Horace Heidt’s popular Youth Opportunity Program as Benny’s replacement on the network. Benny’s first show on CBS from January 2, 1949, also posted below, scored a 27.8 Hooperating versus Heidt’s 11.7. The comedian’s ratings leveled over the last half of the season to average 23.0. Horace Heidt’s half-hour of young amateurs that scored a 15.0 rating average at 10:30 on Sunday, sank to a 9.1 when pitted against Benny from January through May. (Heidt also jumped to CBS the following season.) Meanwhile, Jack Webb‘s Pat Novak For Hire on ABC and Mutual‘s Adventures of The Falcon, which replaced Sherlock Holmes in January, both went unrated during the period. 1949-50 Jack Benny (CBS) 20.7 # 2 NBC debuted its intention to go after Jack Benny with both barrels on July 3, 1949, when it introduced Hollywood Calling, a star studded giveaway show created by Stop The Music producer Louis Cowan and hosted by veteran actor George Murphy who offered listeners a weekly top prize of $30,000. Its mid-summer introduction was intended to build an audience before Benny returned from summer hiatus in September. The hour long show was programmed at 6:30 and designed to hold listeners through Benny’s program on CBS at 7:00. It was a miserable failure. When cancelled in December, Hollywood Calling’s rating average was mere 3.9 versus Jack Benny’s 20.6 for the same four month period. The giveaway show’s half hour opposite Benny was filled by Christopher London, an unrated private eye series featuring movie star Glenn Ford in the title role. Meanwhile, ABC turned the time period back to its affiliates and Mutual programmed The Adventures of The Falcon which received a respectable 8.1 rating. 1950-51 Jack Benny (CBS) 15.6 # 2 Benny’s ratings fell almost 25% but he held on to second place as Network Radio listeners became television viewers by the millions. Still in pursuit of its former star, NBC stumbled after Benny with the elaborate, 90-minute Big Show with only a 5.5 rating to show for its expensive effort. (See Tallulah’s Big Show on this site.) ABC offered nothing to its stations opposite Benny and Mutual programmed The Affairs of Peter Salem, a sustaining private detective series that went unrated. 1951-52 Jack Benny (CBS) 12.9 # 3 It was almost a repeat of the previous season as radio ratings continued to trend downward and Benny was again opposed by The Big Show on NBC as his only rated competition until April when poor ratings - a 5.2 average - finally forced it off the air. The variety show was replaced by the highly traveled First Nighter which was making its eighth network stop and third visit to NBC in 16 seasons. The transcribed repeats of the dramatic anthology were unsponsored and unrated as were The Affairs of Peter Salem on Mutual. 1952-53 Jack Benny (CBS) 11.0 # 1 Jack Benny celebrated his fourth season as America’s Number One Network attraction and his 19th year as King of Sundays at Seven. Bob Crosby replaced Phil Harris as the comedian’s “bandleader” - the first permanent cast change in over a decade. NBC all but gave up the chase during the fall months with Meet Your Match an unrated audience participation quiz hosted by comedian Jan Murray The quiz was replaced at mid-season by My Son Jeep, an unrated family sitcom starring screen actor Donald Cook. ABC and Mutual followed suite with a mix of short-lived, sustaining and unrated entries. When the Network Radio’s Golden Age came to a close in 1953, Jack Benny stood alone as the only performer to have had at least one season as America’s Number One ranked program in all three of its decades. It’s hard to beat a record like that - and nobody could. (1) Jack Benny was preceded in his defection from NBC by Amos & Andy who moved to CBS three months earlier. (2) References are made on the CBS broadcast to Edgar Bergen, who “retired” from his NBC program a week earlier only to reemerge on CBS on October 2, 1949. (3) Recorded repeat broadcasts titled The Best of Benny aired on CBS from October 28, 1956 until June 22. 1958 - again, Sunday at Seven.